The whole kit strength is enhanced greatly, not afraid to general crash. It's crash worth more than 70% compared to common model cars. And the chasis is with dust-proof cover which can protect the electronic componets effectly and prolong lifetime. 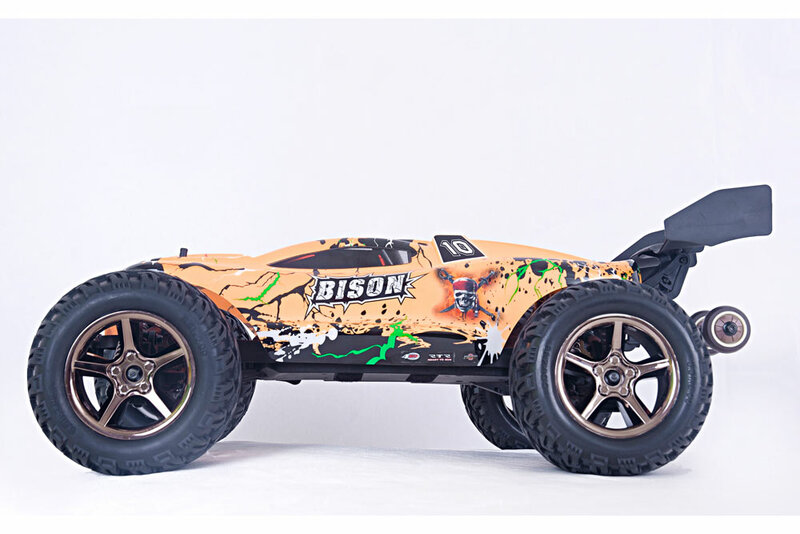 BISON giving you the assurance that you'll be able to deal out the same abuse that all the other nitro-powered trucks can handle! 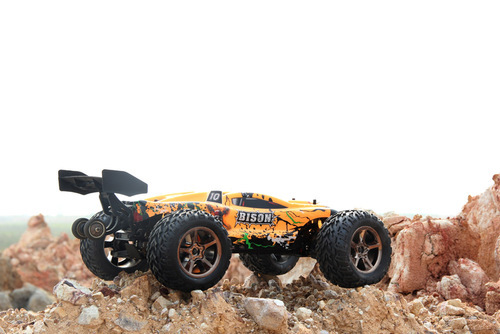 Beefy parts mean the BISON can take plenty of abuse and punishment, giving you plenty of big-air thrills. Extra-thick, super duty dogbones provide the insurance you'll want when you take the BISON way off-road and into rough country! The thick diameter, larger ends and sleek black anodizing add up to all the assurance you'll want that the drivetrain won't let you down when the going gets tough! 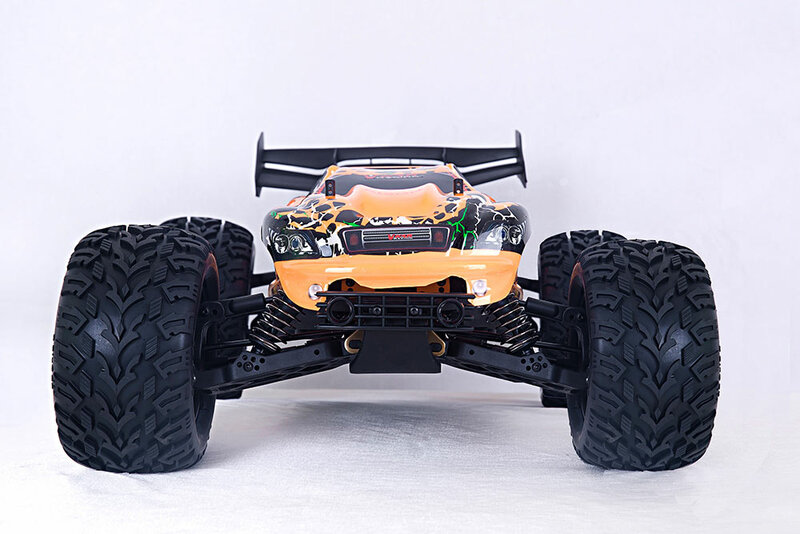 You'll be able to commit the full power of the Brushless motor to the ground without worrying about drivetrain breakages or anything else. 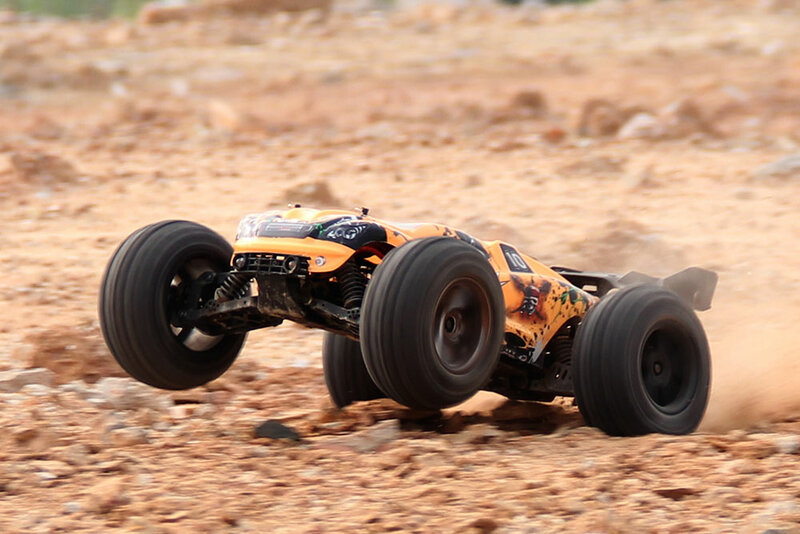 Four huge Big Bore shocks give all the suspension action you need to get out and blast through the roughest of tracks or off-road terrain. With slick aluminum bodies they are lightweight and strong, with almost no friction 'stiction' between the shock piston and shock body. 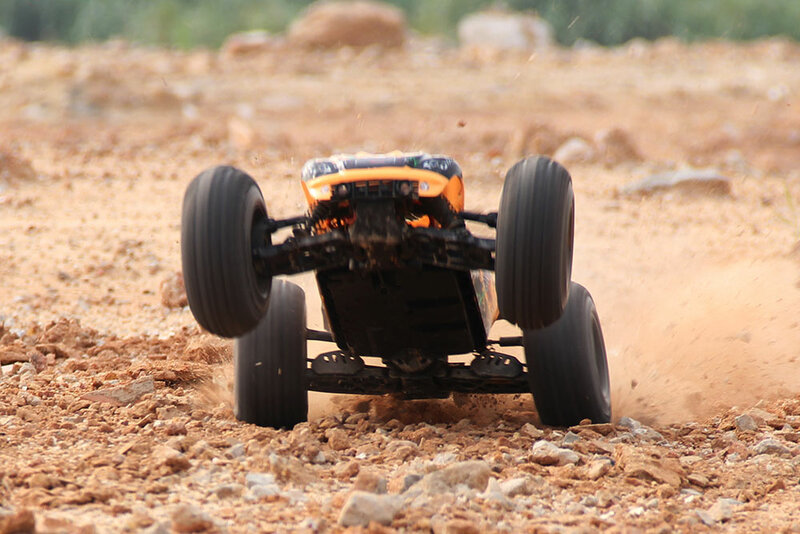 The extra-large capacity gives you extra control and damping action so you have the driving feel that makes off-road driving so much fun! The Wheelie Bar is included as OP part, ready for you to bolt on in case you want to pull impressive wheelies. This design makes the car looks high-end. Also, the special balance feature will not make the car overturned easily. 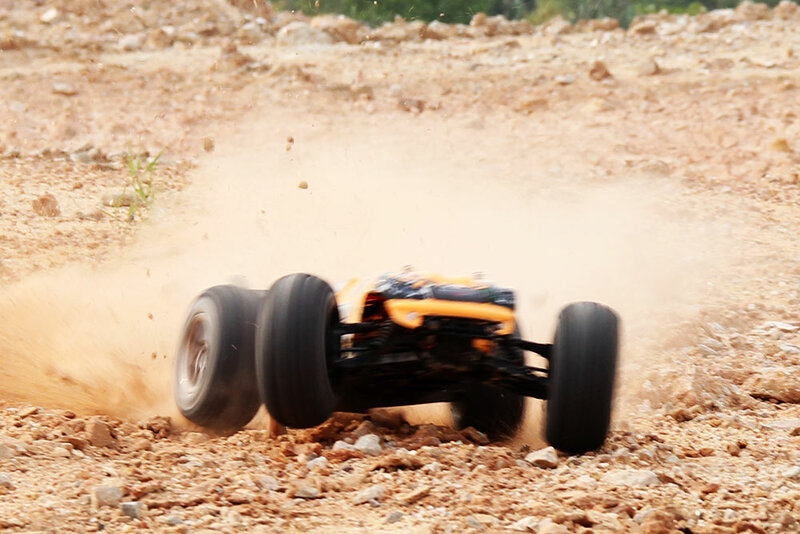 With the aggressive tyres, you can go off-road to on-road with cool, predictable handling and very little drama. 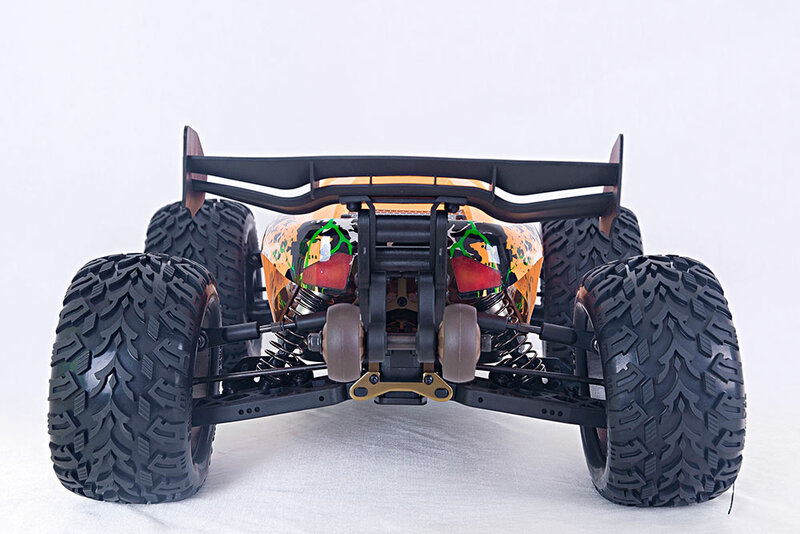 The centre tread lines give you stability on paved surfaces while the side treads and heavy-duty sidewall teeth grip any sort of dirt, mud, muck, leaves, etc. The low CG gives you extra control and cornering ability, allowing you to rule the corners on the track and pull off spectacular stunts to impress. The wing is extremely durable. Multiple angles for your choice and fit your personal need. They are Ready-To-Run. Just a few steps are needed to get your car up and running. Ready-To-Run models bring you the same high performance and quality. It also could be a high end model car kit, if you prefer.